Riot control methods: What's in your riot's menu? How to deal with them? - Çağrı Mert Bakırcı part 2. 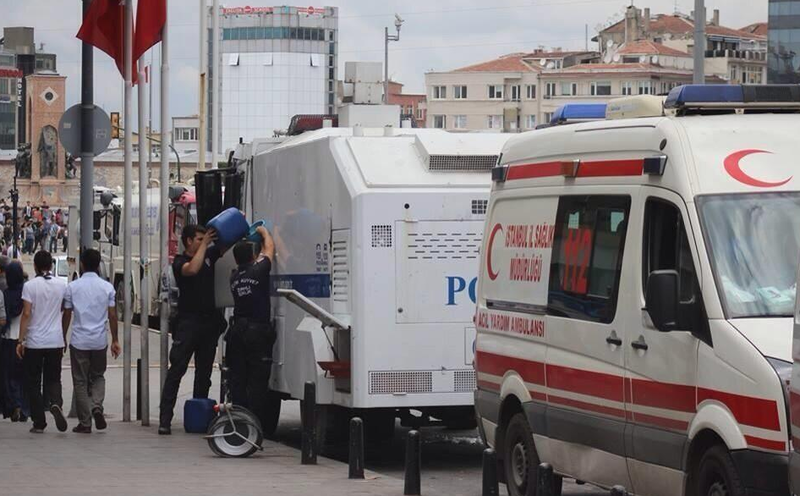 In Turkey, water cannons are mostly produced by Nurol Machine and Industry Inc. These vehicles are used not only in Turkey but also in Azerbaijan, Libya, Zimbabwe, Georgia and Kazakhstan. Although we commonly see the 4x4 wheel structure, there are also 4x2, 6x4, 6x2 and 6x6 wheel structures that can be installed to the vehicle. The most common water cannon in Turkey is the 4x2 type Mercedes Atego 1829K. Its weight is 17 tons and has 300 hp. Its motor is of type Deutz914 and it has a pump that can spray 2400 liters of water per minute with a pressure of 10 bars within a range of 2-30 meters. It can reach a speed of 100 km/h and can climb slopes of 30%. (The slopes we encounter in cities and intercity roads are typically 7-15%.) Water cannons have ballistic protection, which in simple terms means that they are bullet-proof. Water cannon vehicles are 7.45 m long, 2.5 m wide and 3.6 m tall. The water spray on top is computer controlled and the vehicle has a 5000-10000 liter water tank. (On average it carries 7000-8000 liters of water.) Besides this tank, it further contains a gas tank of 60 liters, a paint tank of 60 liters and a foam tank of 80 liters. The water cannon can mix these various chemicals in different portions and spray the mixture. The water cannon can spray the liquid/chemical mixture in three different ways: short, long, continuous. While its water tank can be filled by other tanks, it can also draw water from lakes and rivers to fill its own tank. Its frame has a special protection system: With the use of gas spraying mechanisms on its sides and on its back, it can attack a very large area. Its cabin is armored and remains intact to any physical impact. Its windows are protected, and they are cleaned by a chemical mixture that prevents chemicals from sticking. Thus, spraying paint on its windows would be in vain. The vehicle has its own fire-extinguishing system. It also has mechanisms to adjust the cabin pressure. In short, we can say it is well protected from outside effects. 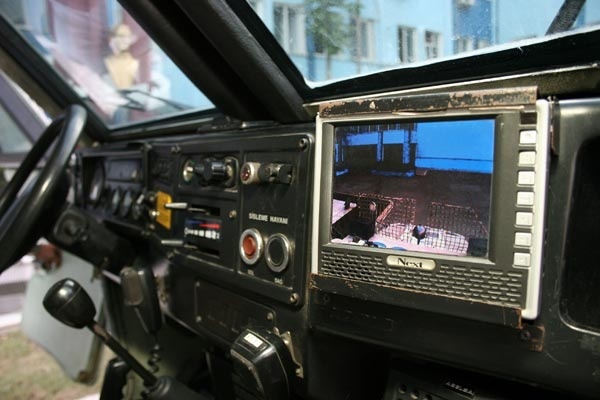 Furthermore it has a monitor and a camera system. Thus the operator can follow what’s going on around the vehicle and spray chemicals from the sides or from the back in order to prevent protesters climbing on the vehicle. Below is part of the brochure prepared by Katmerciler On Vehicle Equipment Industry and Trade Inc., which produces parts for water cannons. To learn more about the water cannons and have a closer look at the vehicle, you can watch this promotional video. Below you can see how one fills the gas tank manually, using material of pepper gas producer Jenix. This is the normal filling procedure, so there is nothing weird in adding pepper gas separately to the water cannon. As we emphasized before, the important point is the content of the chemical and the portion of chemicals in the mixture. The pepper gas (OC) will be explained in the next article. You can visit the website of Jenix by clicking here while Jenix is not the only pepper gas producer in the market. According to a news item published on May 21st, 2013, Turkish Republic broke a record by importing 628 tons of pepper gas. In the last 12 years, a total of 21 million dollars was spent for pepper gas. To compare, pepper gas import in 2001 was just 13 tons, in 2005 it increased to 115 tons and in 2013 it reached 628 tons. The import of such gases is made by cargo planes and by international law, it cannot be carried by passenger planes. A common misunderstanding in the media, based on the warnings on the barrels, is the claim that unusual chemicals are used. 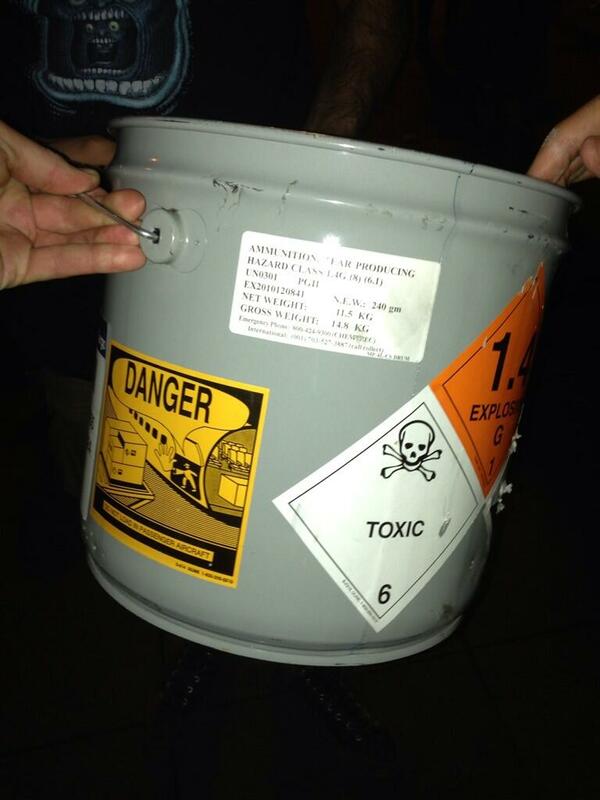 Therefore, these barrels do not seem to contain any information implying that illegal chemicals are used. They are pepper gas barrels categorized according to classification systems. Of course, other images and photos would lead to different evaluations. But the existing images do not present any abnormalities. Yet, as we will discuss separately, pepper gas itself is a chemical weapon and its use is forbidden (although this prohibition is not enforced). According to a news item publish on November 20th, 2010, the Mechanical and Chemical Industry Corporation is cooperating with the Scientific and Technological Research Council of Turkey to produce domestic pepper gas. We were not able to reach a list of domestic producers. This article was written following the protests in Turkey, so we should mention the “Shortland” as well as the water cannon. 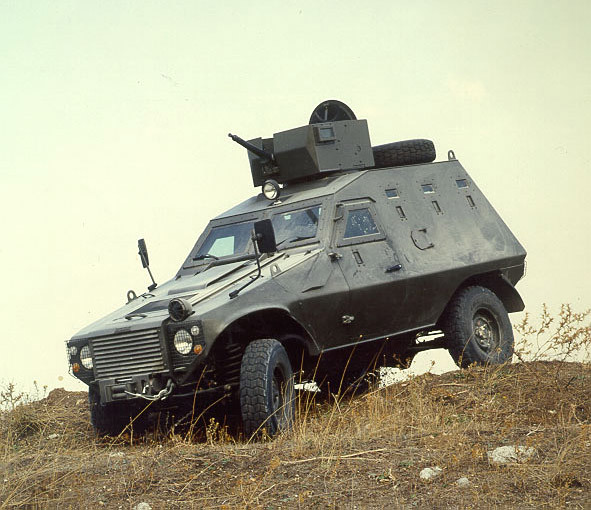 Shortland is an armed vehicle produced and named by Otokar. Shortland is a quicker and smaller vehicle for riot control and it’s designed to carry out duties that cannot be fulfilled by water cannons. The most important aspect of Shortland is its quickness, in contrast to the bulkiness of water cannons. While a water cannon cannot enter smaller streets, Shortland can be used to quickly intervene in the situation. In fact, there is not a single type of Shortland. Shortland is the name for all the vehicles produced under the subsystem of Defender 110 of Land Rover. While there are military versions equipped with 7.62 mm or 12.7 mm machine guns, there are also other types used for the transportation of personnel and for riot control like the ones we encountered in the streets. 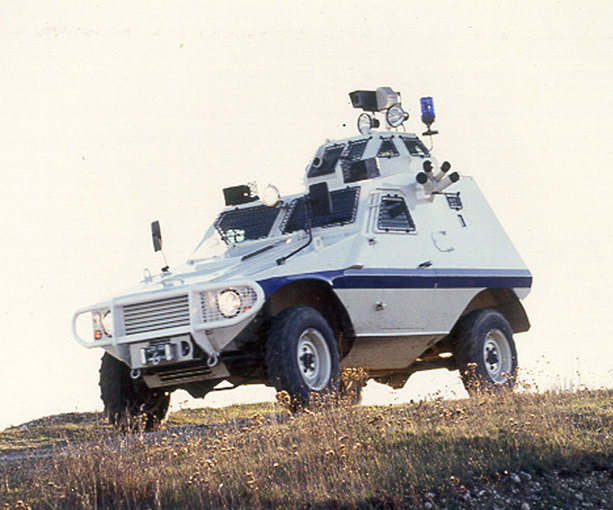 For instance, the above vehicle is a Shortland produced for riot control while the below is another type used for military purposes. We will focus on the former type. This vehicle has night vision systems. So, it can be actively used for face recognition and identification at night. It can also aim automatically at targets by day and night, and shoot gas capsules. As it has 4x4 structure, it can easily drive on land. Due to its special hardware, Shortland is produced without a frame. Shortland is generally used for intervening in smaller streets, carrying the detained to police buses and identifying subjects. The critical problem is that it can cause accidents due to its speed. Thus, one should avoid being close to these vehicles. We will continue our article with scent-based weapons and tear gas varieties. Küresel İklim Krizini Takip Et.